« *** WINNERS *** Lisa, Christine, Laura and Jenny are Living the Life of Riley! CONGRATULATIONS! One of the things I love about having a daughter is going shopping for her and dressing her up in adorable clothes. When I was a little girl, playing with dolls was one of my favorite things to do, and now that I'm a mommy, I have a little doll of my very own again! Since shopping is definitely a passion of mine, I'm constantly scouting out new and unique places to find cute clothes for Riley (and myself). 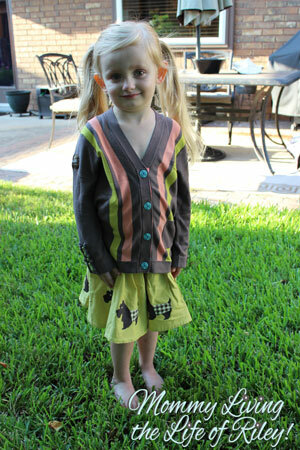 That's why I was delighted to happen upon Matilda Jane Clothing. One thing's for certain at Matilda Jane...you never know what you might find there. It's like going on a fashionable adventure! 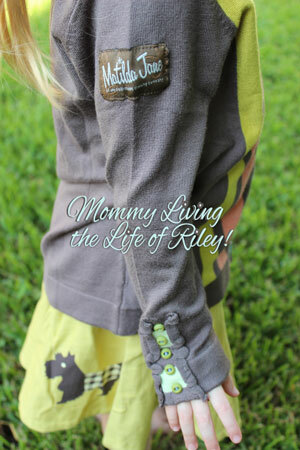 Matilda Jane Clothing offers a wide variety of clothing for both mom and child. The one thing that immediately drew me in to the world of Matilda Jane is the fabulous level of detail and the little "extras" each garment has. Whether its ruffles, cuffs, ribbons or buttons, Matilda Jane Clothing seems to always know just how to catch your eye...and isn't that what fashion's all about? I had the chance to review two charming pieces from the Matilda Jane women's collection of clothing: the Kiara Cardigan and the Salsa Maxi Dress. The Kiara Cardigan is absolutely perfect for the upcoming fall and winter seasons. This chunky boyfriend-styled sweater is a terrific layering piece and will add a wonderful burst of color to your wardrobe. I've found that it pairs beautifully with many items I already own. I'm so ready for the cooler weather to arrive so that I can snuggle up in the soft warmth of the Kiara Cardigan! What's summer without your favorite flowy dress? This seasonal staple is a must-have for beating the heat of those sultry summer days. The Salsa Maxi Dress is made from a soft, polyester-woven fabric that's as flouncy as it is colorful. I really liked how this dress fit well in the chest area, but then flared out under the bustline. I have to admit that I didn't particularly care for the patterns or large front pockets of this dress, for it was a little too Bohemian for my tastes. What I did appreciate though was how well this garment was made and its unique style and attention to detail. As much as I adored the women's Matilda Jane Clothing sent for me, I have to admit that I fell head over heels in love with the two pieces sent for Riley! The Blake Cardigan and Scotty Skirt pairing made for one smart little outfit that is perfect for school, for parties or for play. Riley couldn't wait to try these clothes on and although they are a tad big on her now, I know she'll look simply adorable once her first day comes (in the all-too-near future) to go to school. The Blake Cardigan is perfect for the in-between times of year when it's a little too cool for short sleeves and yet too warm for a jacket or coat. There are a ton of wonderful accents complimenting the bright vertical stripes of this sweater, such as ruffled and buttoned cuffs and a hint of peach ribbon which can be seen when the cardigan is unbuttoned. The remarkable Scotty Skirt comes complete with a Scotty dog border print that adds a hint of whimsy which will set this skirt apart from any other one in your little girl's closet. What's more, the young wheat color is just the ticket for mixing and matching with all of her other favorite fall pieces. Of course, Matilda Jane also thought to construct this skirt from a relaxed knit fabric so that it can handle any adventure your child chooses with flair! What can I say? After my experiences with Matilda Jane, I can honestly say that I'm a new convert. Make sure to browse the wonderful array of unique clothing for both women and children at Matilda Jane. I can assure you that you'll love what you find there! Matilda Jane Clothing is a company that has bucked the trend and chosen not to have an e-commerce store. Store sales are rather made directly though a Trunk Keeper, a representative who gets to know her customers personally. The exclusive sale of clothing by Trunk Keepers is a wonderful direct selling model through which Matilda Jane is able to pay forward business opportunities for entrepreneurial women driven by creativity and relationship building. 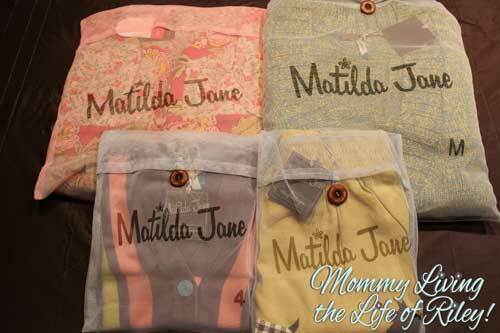 Disclosure: I received the clothing shown above from Matilda Jane Clothing in order to facilitate my review. No other compensation was received. This product review is based on my own personal experiences with this item and is completely honest and objective. Click here for detailed instructions on how to enter a blog giveaway with Rafflecopter or watch a video tutorial on how to use Rafflecopter. Do I have to do everything to be entered? I did most but not all..I might just DIE if I did win the $75 gift card to MJC though. Thanks for the giveaway ! what a beautiful selection of clothes cant wait to shop for fall!. matilda jane clothing ……………….. I like that green cardigan. Thanks for the opportunity! MJ is my favorite brand! Thanks for the opportunity. I love Matilda Jane Clothing!! Lelli Kelly Zoo Girls’ Beaded Canvas Shoes ~ Back to School Fashions to Go WILD Over!